Japanese apartment layouts are described with handy little keyphrases like "1K" or "2LDK." The first number indicates the number of bedrooms, or rooms that are completely separate from the kitchen area. The second set of letters indicates how large the kitchen area is. A K is just a Kitchen, with enough space to hold a sink, stovetop, some food preparation area, a refrigerator, and a microwave. You probably won't squeeze a table into a K area and will end up eating meals inside the bedroom instead. A DK is a Dining-Kitchen combo. The area for food preparation is large and there is enough floor space to accommodate a table and two or three chairs. An LDK is a Living-Dining-Kitchen combo. There is enough area for a dining table, a small couch, and a television. 1. The size of the apartment is indicated in the top-right corner. 2. Note how the toilet and bath are separate from each other. This is not always the case in Japan, but it is considered a desirable trait of an apartment by Japanese. 3. The kitchen area. Since this is a 1K, the kitchen is barely large enough to hold a refrigerator, microwave, stovetop, sink, and one person preparing food. There is no room here for a table or chair. 4. The main room of the 1K apartment. 洋室 (youshitsu) means "Western Style Room." This style of room usually has wood or faux-wood flooring. 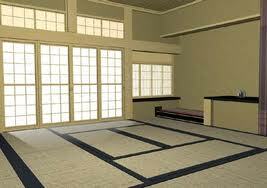 The other common option is 和室 (washitsu), or "Japanese Style Room," which has tatami flooring. (Read more on flooring options.) The number underneath indicates the size of the room in a traditional Japanese unit of measurement, the 帖 (jou). One 帖 is equivalent to one traditionally sized tatami mat, or about 1.65 square meters, or about 18 square feet.